The World register for marine species (WoRMS) aspires to contain all marine species ever described worldwide in one list. With the financial assistance of the project LifeWatch we were able to organize several data grants, meetings and workshops for experts in the course of 2016 designed to further improve this register and continue to complete it. The result? Thousands of new names added, a revision of (tens of) thousands already available names, and the development of new portals and tools, helping the user and editor community in accessing and utilizing WoRMS. In 2016 LifeWatch Belgium supported several groups of WoRMS editors (here specialists in Amphipoda) to commit consultation at VLIZ in Ostend and complete the register. Photo: VLIZ. Early 2015, a call for applications was launched for small targeted data grants to fill the taxonomic gaps in WoRMS. Through the LifeWatch project (www.lifewatch.be), a dedicated budget was made available to allow editors to apply for such a small grant, focusing on completing and verifying the taxonomic information within their group of expertise. For groups that were already nearing completion, a grant could be requested to document e.g. the original descriptions, add information on type localities or focus on the addition of synonym names. Overall by these data grants a total of 3 400 new taxa were added to WoRMS. In February 2016, LifeWatch funds made it possible for Ascidiacea experts from all over the world, and a special guest (the world-renowned ascidian taxonomist Françoise Monniot) to meet for the very first time and to discuss future plans for the Ascidiacea World Database. During this Ascidiacea World Database editor workshop, the editorial team tackled knowledge gaps and issues identified prior to the workshop. Following a hands-on training session about the online editing interface organized by the WoRMS Data Management Team (DMT), many Ascidiacea species records and distribution were added, and several taxonomic issues were resolved during the workshop. The register is online available at: www.marinespecies.org/ascidiacea. Also through the financial support of LifeWatch, the creation of a World Register of Cave Species (WoRCS) has been initiated. WoRCS aims to create a comprehensive taxonomic and ecological database of species known from marine and anchialine cave environments worldwide. In February 2016, eight experts on marine and anchialine cave faunas gathered at VLIZ. During this WoRCShop, the WoRCS editorial team had the opportunity to make editorial agreements and discuss future plans and options in person. The WoRCShop can definitely be labeled as highly successful: during the hands-on session, no less than 900 species known to occur in cave environments have been indicated in the database. 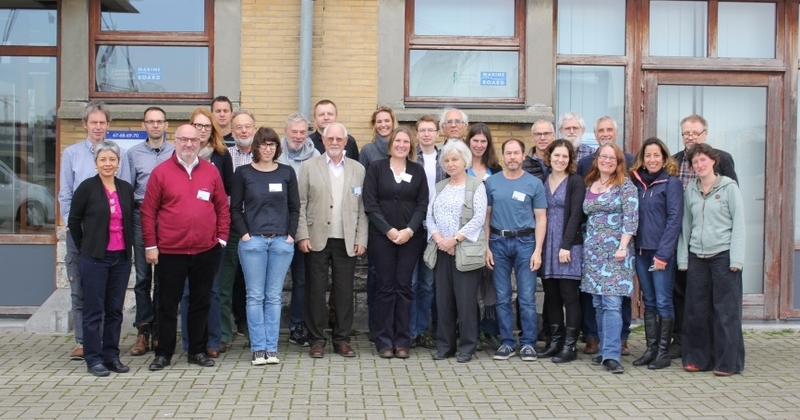 In April 2016, a third LifeWatch-WoRMS workshop brought together – for the first time since the launch of the database in 2013 – the majority of the Amphipoda editors (22 out of 32). During this 2-day World Amphipoda Database editor workshop, the focus was largely on hands-on training organized by the WoRMS Data Management Team (DMT), providing the editors with the tools and experience to actively complete the World Amphipoda Database. Several available tools and functionalities were demonstrated, helping editors to more easily edit using the online interface. All experts entered new taxa and information and edited existing data, thereby improving the content and quality of the Amphipoda Database. The World Ostracoda Database editor workshop took place from 17 till 20 May at VLIZ in Oostende, during which the future plans for the World Ostracoda Database (WOD) were discussed. The goals of this workshop were to: (1) unite Ostracoda WoRMS editors towards WoRMS’s goals; (2) set clear, specific goals for each editor in the future, in order to keep WoRMS complete for new Ostracoda taxa being described, new classifications, new combinations and upload the few taxa already been described but still missing; (3) decide on which higher level taxonomy to use for Ostracoda; (4) assign Incertae sedis taxa to higher levels; (5) get training in the use of the online interface and the available tools; (6) decide on how to document the authorship of taxa; (7) re-write the introduction page of WOD; (8) integrate the “fossil Myodocope Database” into WOD; (9) integrate additional Halocyprida data into WOD; and (10) integrate hundreds of good quality photos taken with scanning electron microscope and optic microscope. The Register of Antarctic Marine Species (RAMS) was started years ago, and aims to identify all marine Antarctic species. Since the start there has been a steady growth, so the initiators wanted to expand the registry to include also the non-marine Antarctic species. The register needed a renaming in 'Register of Antarctic species' (RAS). From 20 to 22 September 2016 a workshop was organized by the RAMS promoters, and the WoRMS Data Management Team took the opportunity to explain the bigger picture of Aphia, the marine gazetteer and the link with LifeWatch, as well as learn the new editors to work with the online interface and the available functionalities of the portal. The Steering Committee of the World Register of Marine Species represents the interests of the WoRMS editor group in all matters related to the database. The Steering Committee consists of 12 elected editors each taking a number of tasks, such as evaluating the scientific accuracy of the available data and identifying or replacing editors who can contribute to the further completion of the data. To put everything in the right direction, the Steering Committee deliberates twice a year. On 16 June 2016 they gathered in Ostend, Belgium and on 14 December 2016 they had a virtual meeting. On both occasions the current status and overall progress was discussed, and priorities were identified, such as the emphasis on documenting the original descriptions of species. In recognition of Aristotle’s important contribution to philosophy and science, UNESCO declared 2016 (the year of his 2400th birth anniversary) as the “Aristotle Anniversary Year”. To celebrate his specific contributions to marine sciences 5 stories were featured, linking Aristotle’s scientific contributions to taxonomy, ecology and species distributions to current-day initiatives such as the European LifeWatch project, the World Register of Marine Species (WoRMS), the European node of the Ocean Biogeographic Information System (EurOBIS) and the European Marine Observation and Data Network (EMODnet). All of the above mentioned work (both grants, workshops and communication) was supported by staff members provided by the Flanders Marine Institute (VLIZ) as part of the Flemish contribution to LifeWatch, and is funded by FWO Vlaanderen.